It was a pretty rough day in the "office" today. 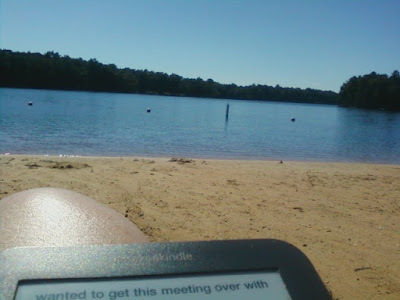 It was THE perfect day for hanging out on our lake's beach. Clear blue sky and plenty warm enough to swim, but no humidity and not so hot that you start to sweat just walking from the water's edge to your beach chair. Since the kids are back in school, I shared the beach with only one other older couple and the "old" man. The old man put me to shame! While I sat parked, like a beached whale, in my beach chair reading fictional fluff and generally pretending to be a slow moving sloth, a man passed by multiple times. He'd swim from one end of the beach to the other then jog back. He did this multiple times. On his fourth or fifth pass, he commented that he was "75 years old & just trying to stay alive." I was so ashamed of my beached whale slothiness, I immediately got up, went into the water with my raft, climbed aboard and promptly fell asleep floating in the water. What can I say? It was a pretty rough afternoon at the office. 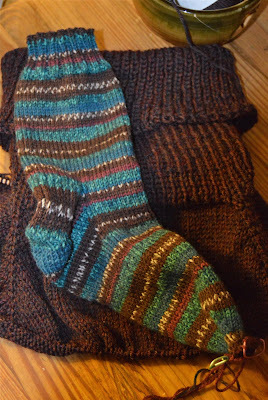 Before I hit the lake, I did manage to finish one of my North Pole socks. The yarn is North Pole from Schachenmayer Regia and I officially love it! I'd bought the yarn at last year's Montpelier Fiber Festival. I'd cast on a sock that night, but I guess the excitement of attending a fiber festival had gotten to me because the sock was big enough to put both feet into. I frogged it & stuffed the yarn into the corner. Sometime last month, I pulled the yarn back out & started over. The socks are one of my "at work" projects so it's been slow going but hopefully I won't get SSS (second sock syndrome.) I hope to finish the second sock before it gets cold enough to wear them.